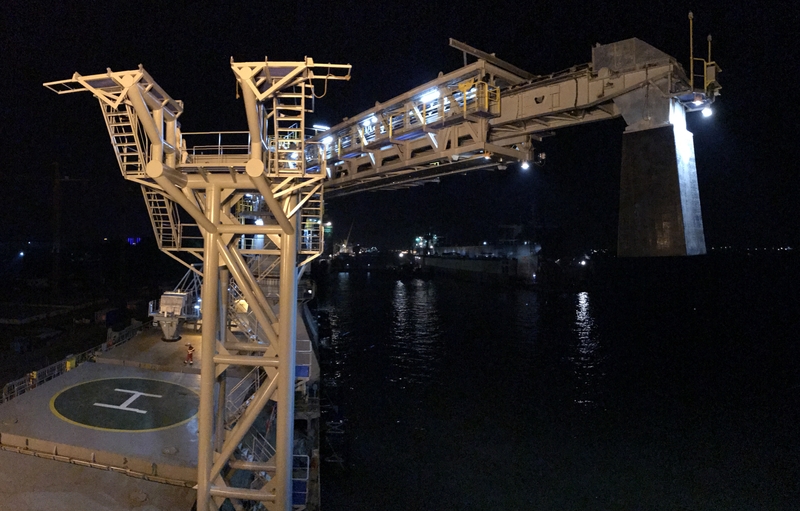 Tracam’s global product recognition and Lextar’s willingness to collaborate has recently produced a unique project offshore. Lextar was the “small fish” in this collaborative project but Lextar’s input was recognized as significant in the finished product. Those involved included a Canadian shipping company, Canadian specialist automation companies (both hardware and control) and a Chinese mining company. The project involved a self unloading transshipping vessel, “One big boat with one big load”. The self unloading system consisted of four synchronized conveyor belts and 21 independent gates. This system is a well proven and efficient method of transshipping raw materials. A camera system was required to monitor key aspects of the loading and self-unloading process. The investment in the monitor system is expected to further improve offload efficiency and enhance safety during the materiel transfer processes. Mobotix was the product of choice. A harsh industrial environment in open ocean conditions required a quality product with the IP rating to survive. The client also requested high quality, high resolution images with flexible configuration parameters , Mobotix was the fit. Mobotix Australia in conjuntion with Madison Technologies provided unwavering support during the development and installation periods of this project. The Mobotix system consisted of both M15 Day/Night and M25 cameras along with a marine specific Pan Tilt assembly. The pan tilt assembly is fully integrated to the Mobotix System and was designed to “mount, plug and play”. An M15 Day/Night camera was used in conjunction with Mobotix I/O Module and Code Converter. The Pan Tilt assembly was controlled via MX Manager ( Mobotix video management system VMS) using Pelco D protocol. The stainless steel junction box (housing the power supply) and P/T mounting bracket were all fabricated and assembled prior to shipping to China. Mobotix MX Manager proved to be the perfect VMS for the project. The new revision 1.4.0 has enhanced Windows based functionality and is far more intuitive. All in all an interesting project with future potential.